If you own a locked Verizon iPhone and want to switch to other carrier due to poor Verizon connection or some other reason, then you will need to unlock Verizon iPhone first. After unlocking, you will be able to shop around for plans at other carriers. The process is quite easy. Why My Verizon iPhone is Locked? Verizon usually doesn’t lock its phones. However, because of increasing number of phone thefts, especially iPhones, Verizon plans to lock its phones. According to the largest wireless carrier in the nation, it would start locking the phones soon. If an iPhone is already locked, then it is done by the company as a protective step to deter criminals from stealing the phone, particularly from the stores themselves or on route to retail stores. Unlocked phones can be sued overseas with different carriers or sold on the black market. Because of these reasons, they make attractive targets. This is especially the case for iPhones as they have high resale value. Verizon doesn’t lock most of their phones. So check whether your iPhone is already unlocked by putting a SIM card of another carrier and trying to call from it. Make sure you don’t have flags on your account or any overdue payments. Resolve such problems before trying to unlock your iPhone. You should be listed as an account owner, otherwise you won’t be able to unlock your iPhone. You should have your account information on-hand. That includes your Verizon login details, your iPhone’s model and IMEI number. Step 1: Open Phone app on your iPhone and tap Keypad. Step 2: Call Verizon customer support by dialing *611. Step 3: Once you are connected, you will have to wait for the prompt from the automated voice and then say ‘carrier unlock’. Step 4: Next, explain the reason why you want to unlock your iPhone. Step 5: Provide the requested information such as login details, IMEI, etc. Step 6: The Verizon representative will confirm after a few minutes that your iPhone has been unlocked. You will also receive text or email regarding the confirmation. Step 7: After receiving confirmation, insert a SIM card from another carrier to check that it is unlocked. It is recommended that you erase your data after unlocking Verizon iPhone, and before using the SIM card of another carrier. iPhone store private and sensitive information such as carrier details. Completely erasing data before switching to another carrier will allow you to permanently get rid of such private information and you will be able to enjoy the services of a new carrier without worrying about any privacy issue. You can achieve this by using iMyFone Umate Pro for Win or for Mac. 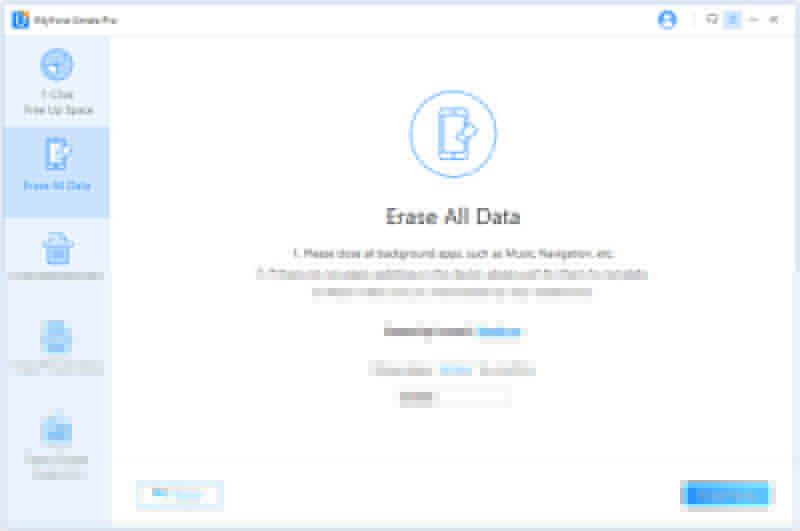 It is one of the best data erasing tools designed for iPhones and allows you to erase iPhone data permanently, making it 100% unrecoverable. It's recommended by lots of media, like MacWorld, iPhoneinCanada, APPKED, etc. Erase iPhone data permanently so that no recovery software can recover it. Erase private data and sensitive information to protect your privacy. Scan and erase data traces of deleted files to make them unrecoverable. 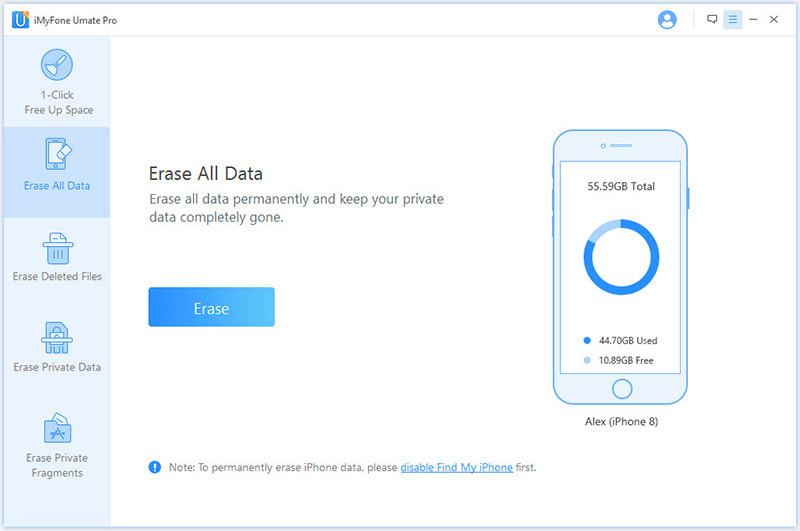 Erase all iPhone data quickly within a few simple steps. It is ideal when you are about to sell/donate your iPhone. Clean up iPhone space to boost its performance for free. 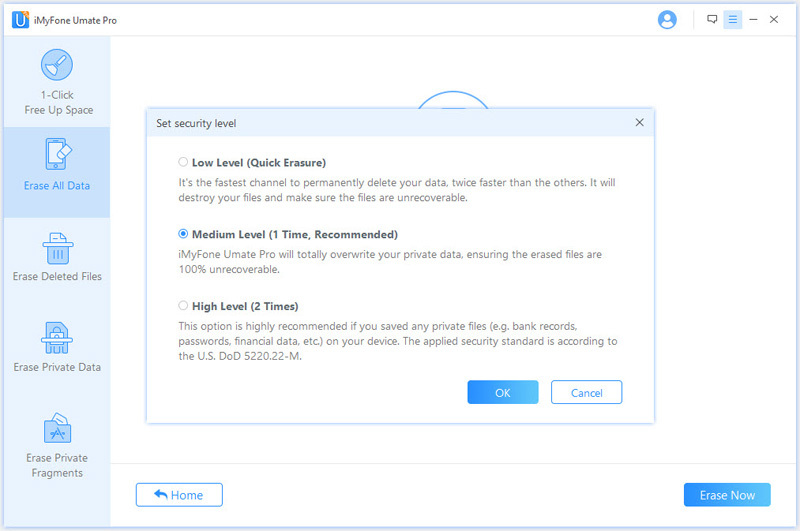 Step 1: Launch iMyFone Umate Pro on your Mac or Windows PC. Step 2: Use a compatible lightning or USB cable to connect your iPhone to your computer. Step 3: Choose ‘Erase All Data’ tab from the home interface of Umate Pro. Click the ‘Erase’ button to proceed. Step 4: Select ‘Security Level’ of deletion. You can choose from low, medium, and high. Step 5: Type ‘delete’ in the textbox provided under the ‘Security Level’ selection. Step 6: Click ‘Erase Now’ button to proceed. Data deletion process will begin. Before using another carrier on your unlocked Verizon iPhone, you will need to make sure that it is compatible. This is because Verizon phones run on CDMA network and not all carriers are CDMA. Some specific Verizon phones can be activated on MVNO carriers including Straight Talk, Net10, and Red Pocket. Switching to Sprint should be quite simple because it is a CDMA carrier. If you want to switch to T-Mobile or AT&T, then you will need to check for compatibility because they run on a different network type.